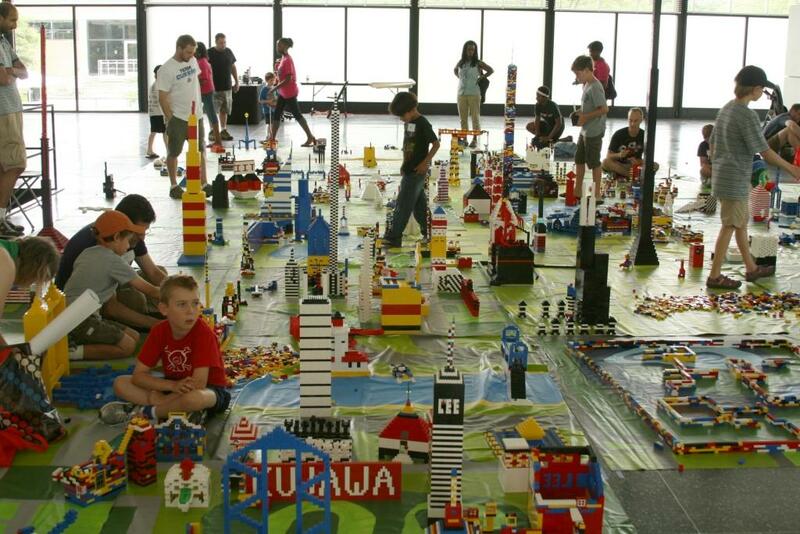 Children and adults alike build a city out of Legos in IIT’s Crown Hall in 2011. The city will be built anew this weekend. 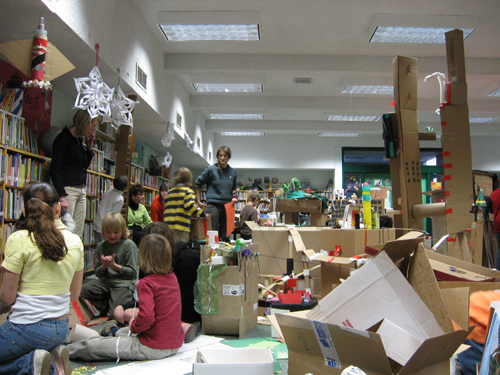 New Your City, Ian Cozzens’ collaboratively built cardboard city, in the Fox Point branch of the Providence Public Library in 2007. Cozzens, center, helped kids channel their inner urban planner. The careful chaos of New Your City. 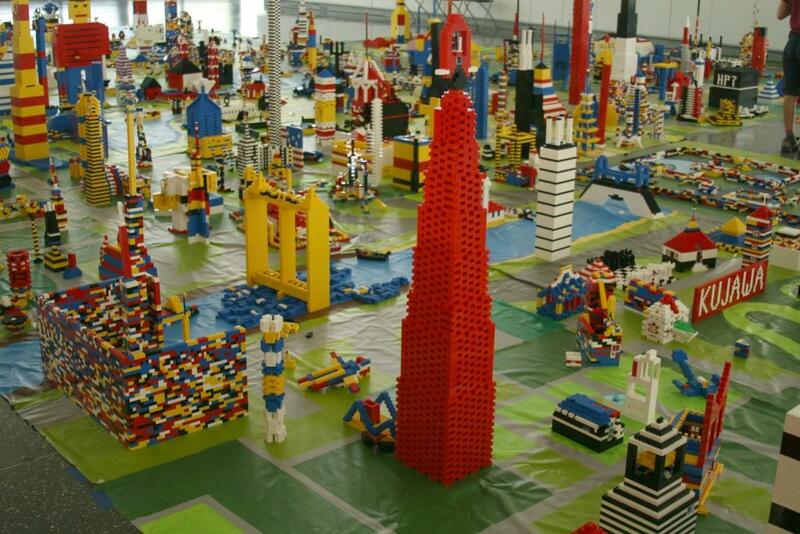 Would-be architects and urban planners take note: this weekend you have the chance to join with fellow builders and toy-enthusiasts to construct a vast miniature city made entirely from Legos. The event is sponsored by Illinois Institute of Technology’s Alumni Association and the school’s Mies van der Rohe Society, dedicated to honoring IIT’s most influential architecture school dean and campus planner. The design and build session, which is now in its fifth year, normally takes place in Crown Hall -- a Mies masterpiece -- but was moved this year to the Rem Koolhaas-designed McCormick Tribune Center, tucked under the corrugated metal and concrete Green Line tunnel that has become a campus icon of its own. Perhaps in the spirit of Koolhaas’ playful campus addition, participants are encouraged to channel their full creative energies. Photos from previous years reveal a slate of pint-sized buildings that many Chicagoans would find familiar: tiny Willis Tower replicas and vertical-lift bridges, for example. But one also sees fantastical pyramids, pagodas, spires and a big-footed monster building or two. No doubt the plans for Saturday’s lego city build are fun -- after all, this is same medium famously used to build everything from a miniature Death Star to tiny taxidermy. But this kind of fantastical, collaborative building project has also has the potential to engage its participants in a kind of critical thinking about their role in the built environment that surrounds them everyday. It may even have the power to challenge visions of city planning as led by singular architectural and artistic geniuses like Mies van der Rohe and Rem Koolhaas. Consider New Your City, a project orchestrated by the Providence, Rhode Island-based artist Ian Cozzens (who, for disclosure, is a close friend of mine). In 2006, Cozzens had just finished an architecture degree at the Rhode Island School of Design. But he was feeling frustrated and uninspired by his visions of a future in the profession. Cozzens was already admired for making highly-detailed silk screen prints based on elegant and carefully rendered architectural drawings of Providence’s historic buildings. But now he started looking for way to make his work more collaborative and more democratic. He began reading the work of Bernard Rudofsky, whose 1964 book Architecture Without Architects explored the richness and power of communally created works made by untrained builders. “I definitely love the abdication of control and power,” Cozzens said. So Cozzens partnered with a local branch library in Providence, and carted in masses of cardboard boxes and tubes, construction paper, cotton balls, Elmer’s glue and whatever other crafting bric-a-brac he could find. Then he invited in local children to build a city, in miniature, in the normally staid and quiet space. The project, eventually dubbed New Your City by one of its young builders, gave kids a chance to channel their hyperactive energy and control their built environment like never before. “We’d err on the side of anarchy as opposed to control,” Cozzens said. But New Your’s citizens also faced a microcosm of the same kinds of land-use and property-rights issues adults might face in real city planning. For instance, one child would erect a house, and another would deface it with the scrawl of a marker, or rip it down and build a tiny cardboard highway in its place. At this point, Cozzens said, the question raised by the project became: How do you build a city in a way that respects the visions and needs of all its inhabitants? New Your City was resurrected in the library again the following year, and Cozzens hoped the project gave the kids who participated a sense of agency. 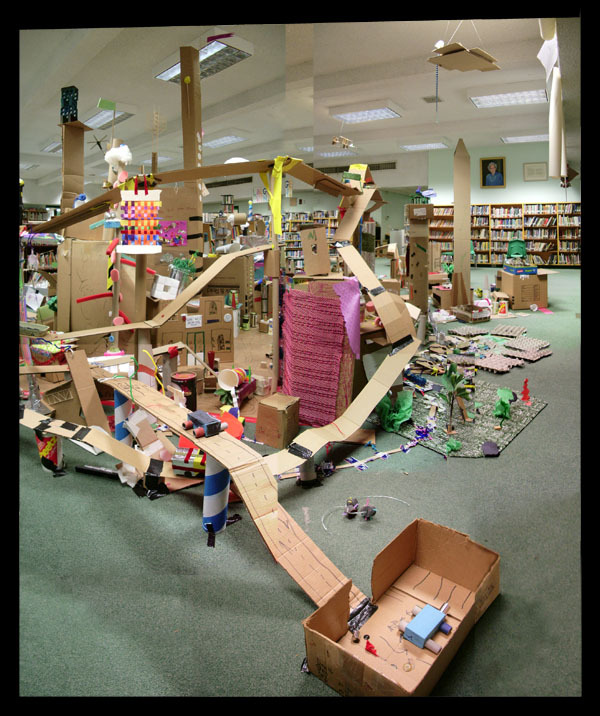 Cozzens recalled one kid who was frustrated with the flimsiness of the cardboard and the short-lived nature of the project -- after all, New Your City couldn’t stay in the library forever. Build a Lego City takes place July 13 from 10 a.m. to 1 p.m. at the McCormick Tribune Campus Center on the IIT campus, 3201 S. State Street. Registration for the event is currently closed. Robin Amer is a reporter and producer on WBEZ’s digital team. Follow her on Twitter @rsamer.